The Bona Stone, Tile & Laminate Floor Care System includes everything you need for easy and safe cleaning of your hard surface floors. It is specially formulated for linoleum, stone, terrazzo, vinyl, sealed porous marble, laminate and no-wax sealed tile (ceramic, Mexican Saltillo, quarry). Includes Bona Microfiber Mop, Bona Microfiber Dusting Pad, Bona Microfiber Cleaning Pad and Bona Stone Tile and Laminate Cleaner. The quick & easy Bona Stone, Tile & Laminate Floor Cleaner is safe and effective for use on hard surface floors. The specially designed degreasing formula effectively removes dust, dirt and grime leaving your floors clean and beautiful. The GREENGUARD GOLD certification confirms it's safe for use in your home and around your family. Concrobium Luxury Vinyl Floor Disinfectant Cleaner cleans and restores floors to their original lustre with a streak-free shine. The fresh scent formula removes dirt, grime, dust, scuffs and spots from almost any type of hard flooring. Use on Allure<sup></sup> Luxury Vinyl tile or planks, hardwood, laminate, vinyl, ceramic, sealed concrete, marble, granite, sealed cork and other hard flooring surfaces. Regular use of this product contributes to a healthy home environment by reducing the allergens that can collect on floors. HDX Multi Surface Floor Cleaner restores shine to floors while removing dirt, grime and grease. It works great on vinyl, sealed concrete, stone flooring and a variety of surfaces without leaving unsightly residue on wood, vinyl and ceramic flooring. This floor cleaner is ideal for kitchens and bathrooms. Hardwood Floor Cleaner Refill with Free Cleaner, 651ml is rated 4.3 out of 5 by 5923. Rated 5 out of 5 by begrammy from Greatest Hardwood floor cleaner ever We bought a home with hardwood floors. The floors were dull and so streaky. I tried everything to get them back to there natural shine. One day I was standing in the floor cleaning isle and saw the Bona kit. Since I was so frustrated I figured why not give it a try. I am so glad I did. My 14 year old hardwood floor look new. They shine and have no more streaks or haze. I tell everyone about the beauty of Bona. Rated 1 out of 5 by SharonLynch from Sticky residue Just us d Bona on my hardwood floors for first time. What a disappointment. There is a sticky residue that I don’t get when I clean the floors with white vinegar and water. I cleaned one section with vinegar and water and the difference was extreme. It seems the old and inexpensive approach may be better for my floors. 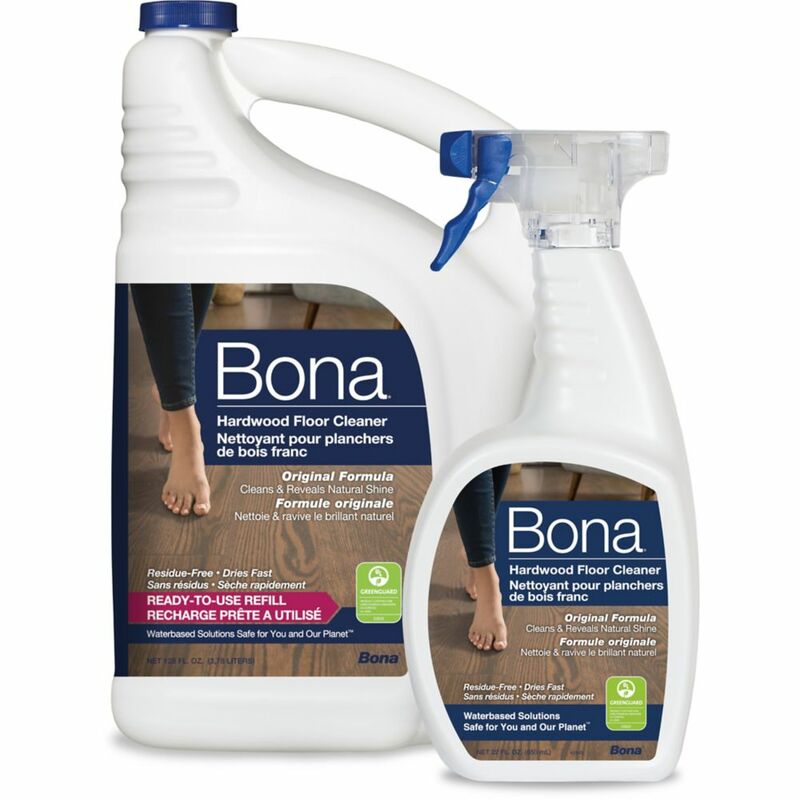 Rated 5 out of 5 by Amy14 from Only Product for Wood Floors Since having wood floors installed last year, I have used Bona products to keep my hardwood look brand new. Is this product safe to us on prefinished hardwood floor? Is this product safe for pets?